Margaret Ikape is a Nigerian who always loved space and astrophysics. However, she felt she needed a better grounding in Mathematical Sciences before she could make a difference in astrophysics. She applied and was accepted to AIMS Cameroon. At AIMS, she discovered that students from across Africa were equally motivated to pursue excellence and transform the continent by applying mathematical sciences to problem solving. The camaraderie among students made for an incredibly innovative environment for students and lecturers to do their best work. 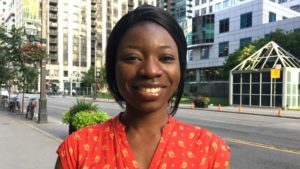 When she completed her scholarship in Cameroon she headed to the University of Toronto to study for her Masters in Astronomy and Astrophysics. In Canada, she has access to huge computing facilities to do simulations and modelling. Being in the department of astronomy allows her to focus on her studies of the evolution of super massive binary black holes in galactic nuclei. Margaret has also been motivated to share her knowledge and pay her success forward. She got involved in the West African International Summer School for Young Astronomers (WAISSYA) held in Accra, Ghana in August 2017. Astronomers from Canada and Germany teach young and aspiring astronomers from West Africa in a one week inquiry-based school. She was one of the instructors and also introduced AIMS to participants who want to continue their studies.